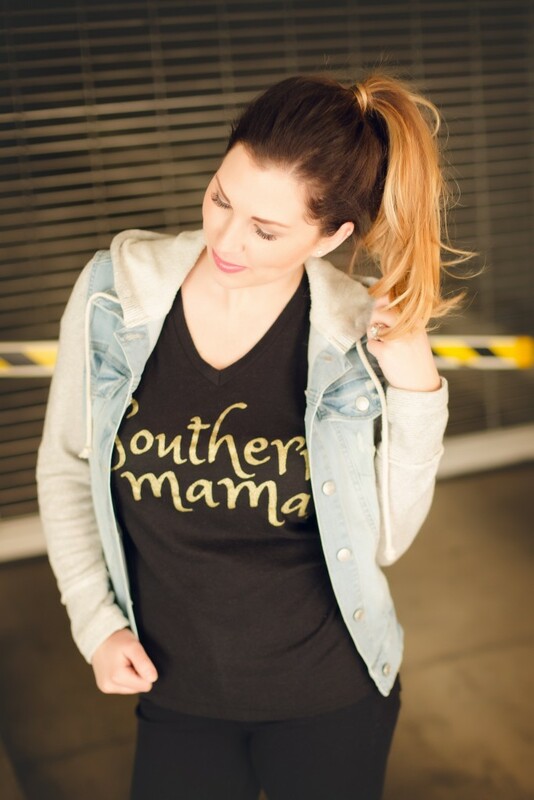 If you’re a mama, you know how easy it is to live in yoga pants with a top knot and no makeup! We often take care of everyone else before ourselves. For me, being a mom to two little ones is BUSY and we love our play dates! They give my boys a chance to play with other littles and they give this mama some adult interaction! Can I get an amen?! No matter how busy life gets, I’m making a point to do things for myself and adding cute little pieces into my everyday looks is my favorite! 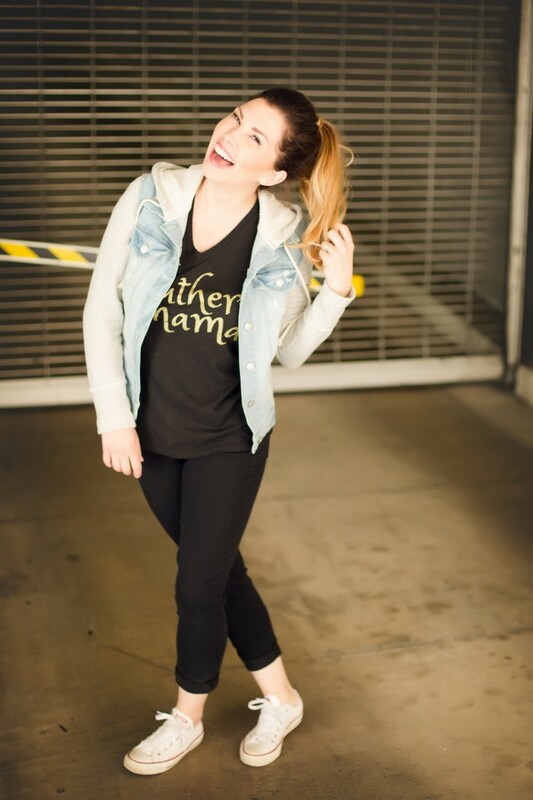 My staples for day to day life are cute tees, comfy & stylish denim, and converse! Of course, yoga pants and tennis shoes are a must too! :) It’s pretty amazing how something as simple as getting dressed can change your day. This is one of my favorite looks right now! 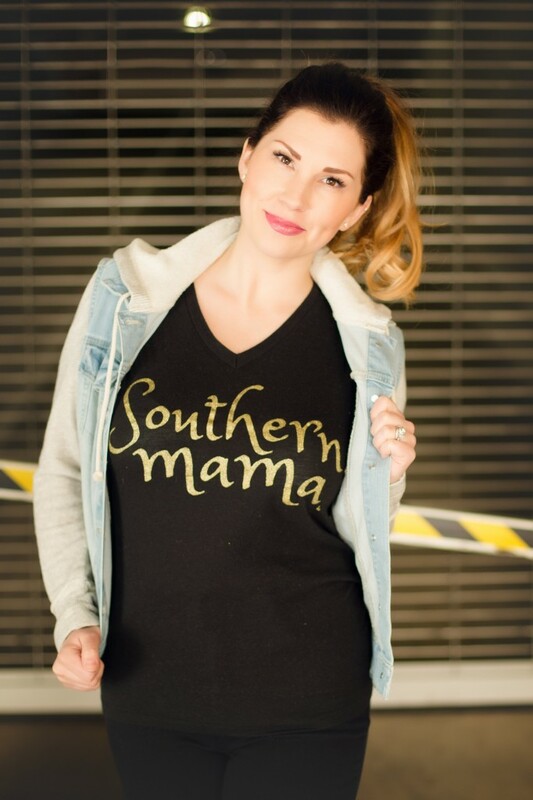 This Loved by Hannah & Eli tee is obviously a favorite because if you know anything about me, you know I’m a southern girl through and through! 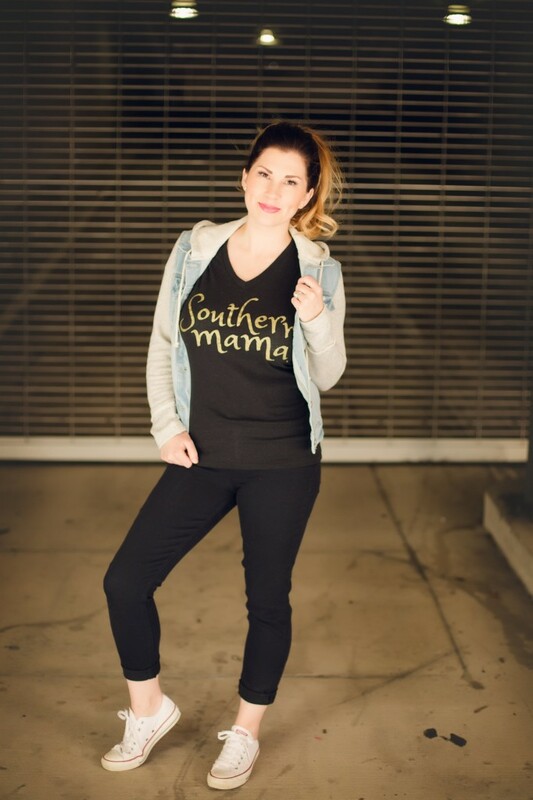 I’m also loving black denim lately now that I’m back down to pre-pregnancy clothes! (insert praise hands emoji here) You can’t ever go wrong with a denim jacket and this one from Target was such a great find! It’s still a bit chilly here in Tennessee, so having a light jacket on hand that happens to be cute is always a plus! Whether it’s this outfit or another, I make a point to dress in something that allows me to run around with my boys! Now don’t be fooled, I don’t fix my hair or put on makeup all the time and by the time 5 o’clock rolls around, I’ve usually got spilled milk or leftover snack stains on me somewhere, but I’m taking the time to take care of myself and do little things that make me feel good. What are your favorite pieces for play dates with the kiddos? Such a cute look. You look gorgeous as always! You look great! I usually wear leggings and a blouse to play dates. Try to step it up from sweatpants and hoodies but still easy to move in! 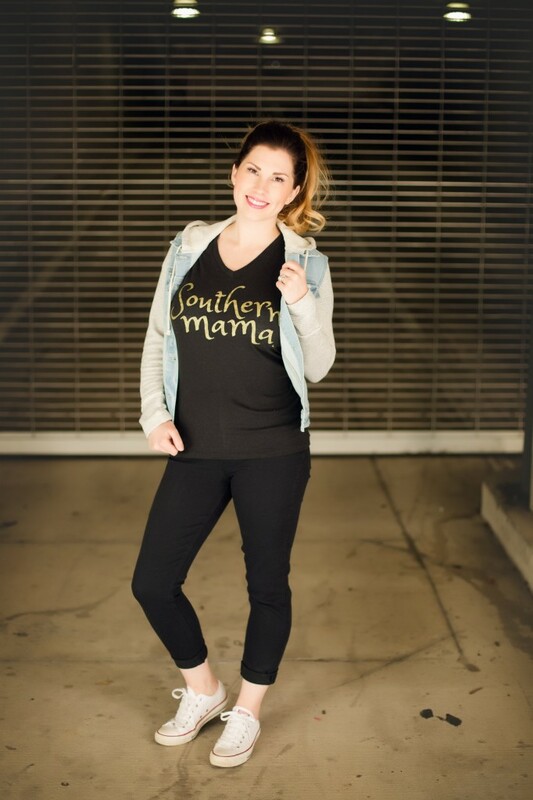 This is a super cute mommy look! Great play date look Momma! 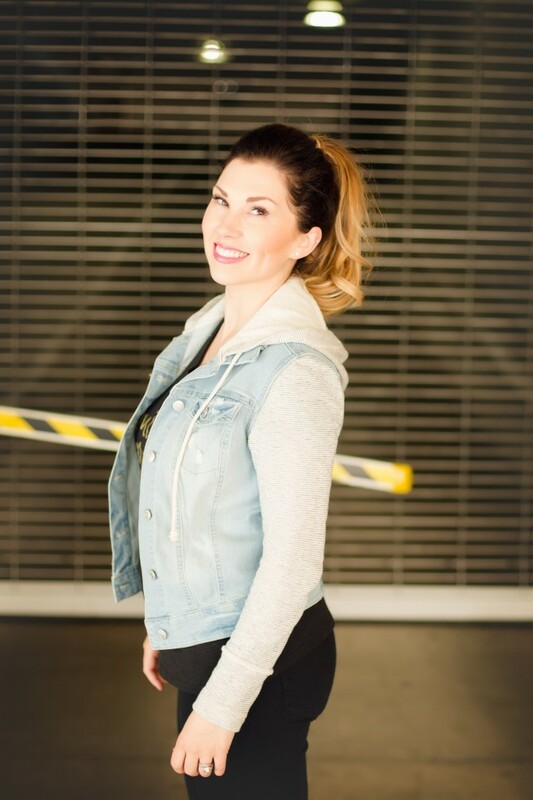 I can assure you that you would be the most chic Momma out on a play date as so many Mom’s wear workout gear all of the time. Nothing wrong with that of course, I’m guilty, but I love how you stepped it up with this look! Gorgeous as always! Cute! Love the top and your ponytail is so bouncy and adorable. Thanks girl! A pony is my go-to! Lol! I love this! Those are my fave shoes too! Thanks, friend! Me too! My go-to shoes are always chucks! This is THE perfect look for a playdate or errands! A much better step up from my usual yoga pants hahahaha. And heck yes to the white chucks!! Thanks, girl! :) I do love me some yoga pants though! LOL! I have this tee and love it! But I def need to wear it put together as you did- so super cute! Girl, you are so dang cute! You look fantastic! Comfy and put together. I love wearing my stretchy jeggings on playdates — super comfy for joining in on the fun!